Update: All events are SOLD OUT. Check back at 23:59 CST on August 17th when we release any unclaimed reserved tickets. Three weeks ago, we announced the dates for 2015 World Championships and a new process for registering for our largest event of the year. In order to make sure everyone has a full understanding of registration before tickets go on sale June 15th, we’re posting today to give you an in-depth guide for registering. Registration for the 2015 World Championships goes live at 12:00 PM CST on June 15th at https://fantasyflightgames.thundertix.com/events. 2015 World Championships registration will be handled entirely through this website. There will be no on-site registration. A single event pass will cost $60. Each additional event you play in will cost an extra $10, up to a total of $90 (four events). You do not need to register for any side events ahead of time, and all side events will be free to play in (except for the War of the Five Kings). Please be aware that participants in the A Game of Thrones: The Card Game Draft Championship will be charged an additional fee on site ($15) to cover the cost of the draft sets that will be provided. After you have purchased your pass, you will receive an email with your confirmation code. You will use that code to register for the number of World Championship tournaments that you indicated when you paid for your pass. We have reserved a number of seats for our U.S. Regional Champions, North American Champions, and select National Champions from around the globe; all non-reserved seats for the 2015 World Championships will be made available on a first come, first serve basis. This open phase of registration will end as soon as all non-reserved tickets are sold. Beginning at 11:59 PM CST on August 17th, if any of the seats reserved for our U.S. Regional and National Champions remain open, we will reopen registration, and they will be made available to the public. This final phase of registration will end October 2nd or immediately when all tickets are sold. Head to the registration site and click on the “Continue” button for the number of main events you want to participate in. For example, if want to play in the Android: Netrunner and Warhammer 40,000: Conquest World Championships, you would select the World Championship Weekend 2 Event Pass. If you wanted to play in all of the A Game of Thrones tournaments (Draft, Melee, and Joust World Championships, as well as the Second Edition War of the Five Kings tournament), you would select the World Championship Weekend 4 Event Pass. We recommend checking the 2015 World Championship schedule before purchasing a pass. On the next screen, double check that you have selected the correct ticket you wish to purchase and make sure that you have selected a quantity of “1.” Then click on the “Continue” button. 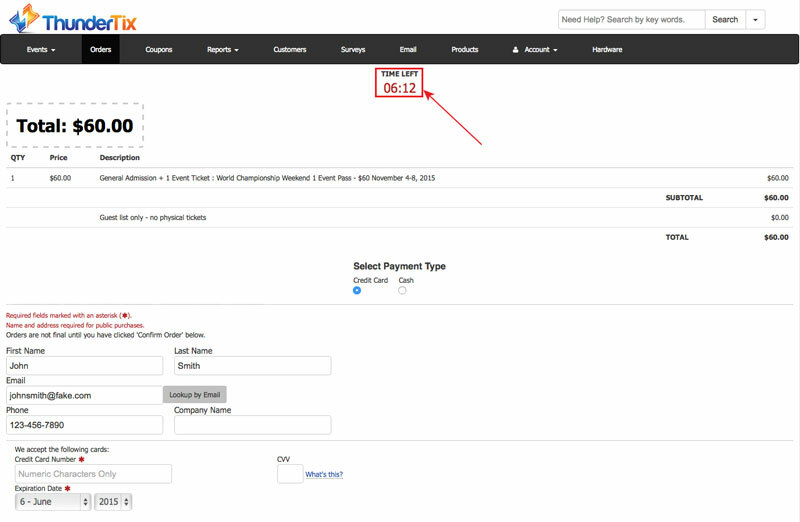 Be aware that you will have only 7 minutes to fill out payment information. Do not click on the “Continue” button until you have your credit card and address ready. Enter your full name and email in the labeled fields. If you have used ThunderTix before, you can look up your information using your email. Fill out your credit card information and address as you would with any other order online. Important: Do not click on the “Confirm Order” button on the bottom of the screen until you have entered a T-shirt size! If you do not enter a T-shirt size, we cannot guarantee you will receive a shirt that fits. Finally, leave the box marked “I’d like to add this customer…” checked so that we can contact you via email with any important updates. 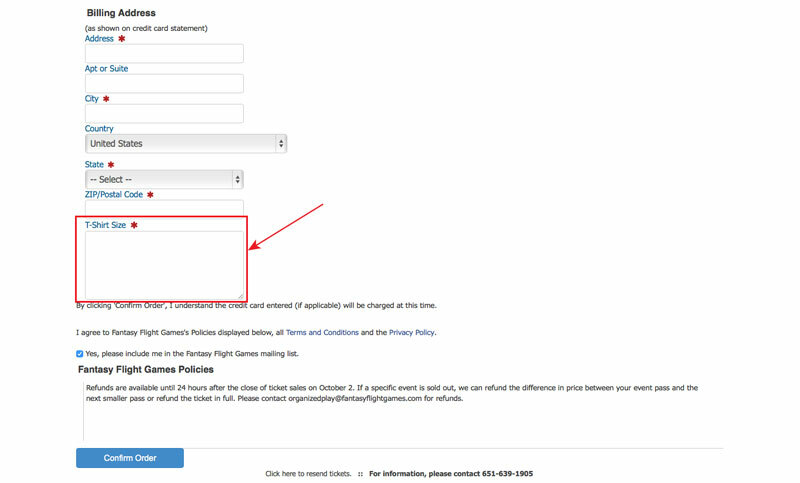 We cannot guarantee you will receive timely information for World Championships if you uncheck this box. Shortly after confirming your order, you should receive a confirmation email. You have not finished registering for your World Championships at this point! Double check your order to make sure you received the pass you wanted. 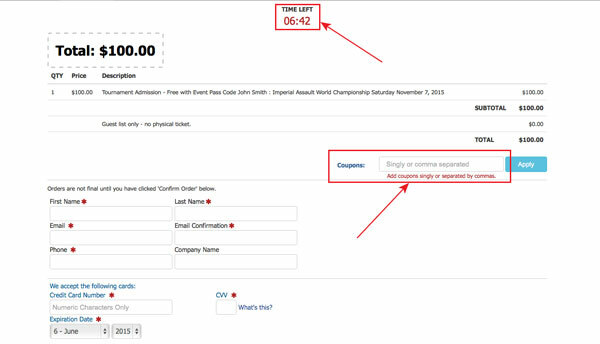 Then you will need to register for specific events using the coupon included in your email. To register for specific events, click on the event listings for the games you wish to participate in. You can register for a number of events equal to the event pass you bought. For example, if you purchase a 2 Event Pass, you can register to participate in two events. Registering for each individual tournament will be similar to the earlier process. When you select a particular tournament, you will have to again choose a quantity. However, this time you will also have to enter your full name before continuing. Note: The price will be listed at $100. Do not worry! The coupon code you received in your email will reduce that price to $0. On the payment page you will again have seven minutes to complete the process. Enter your coupon code in the coupons box just below the event description and price. As soon as you click on the “Apply” button you should see the price change to $0. Then fill out your personal and payment information again. Make sure to reenter your T-shirt size and then click on the “Confirm Order” button. 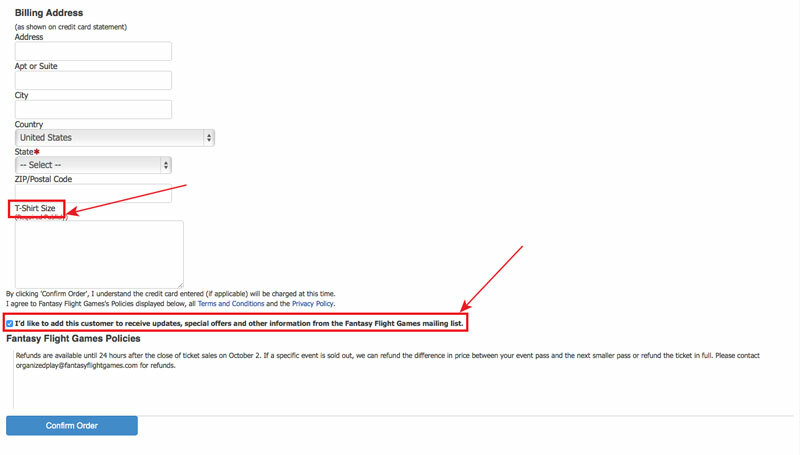 If you bought a 2, 3, or 4 Event Pass, you will have to repeat this process for each additional event beyond the first. The code you receive in your email will work for each event you register for. National Champions and U.S. Regional Champions should contact [email protected] for access to their reserved spots. We will reply with access to your reserved spot, and the process for registering will be the same as the registration process outlined above. Reminder: The spot reserved for National and U.S. Regional Champions is only in the game for which they won their tournament. National and U.S. Regional Champions must still register for other events on their own. 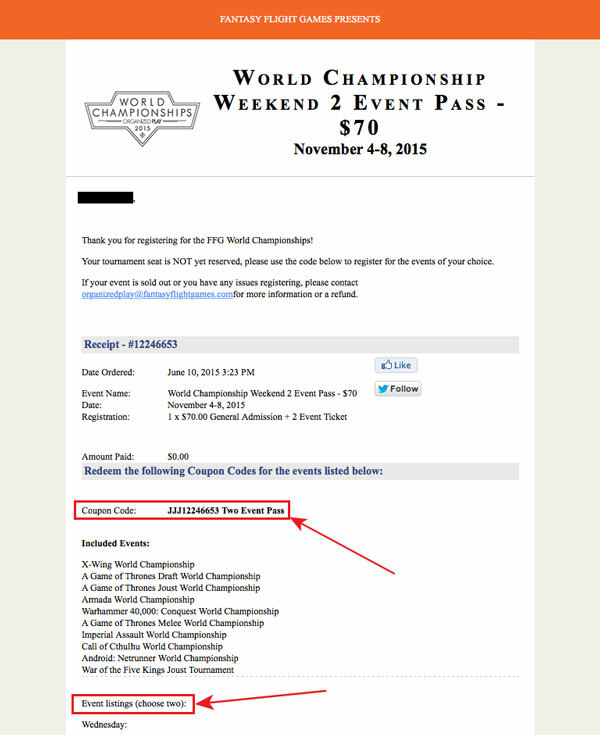 All side events at 2015 World Championships are free to anyone with a World Championship pass. If you have registered for at least one Championship event or the War of the Five Kings tournament, you can play in any of the side events. However, side events do have limited space, and entry will be limited to a first come, first served basis. 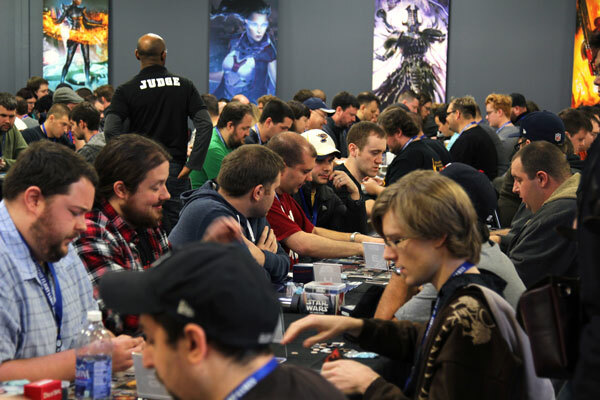 Note: Draft side events will require players to purchase their own product from the Fantasy Flight Games Center. Registration for 2015 World Championships opens next Monday, June 15th, at 12:00 PM CST. Tickets will be in high demand, and we recommend registering as soon as possible to guarantee your spot in the tournaments of your choice. We would love to see you in Minnesota in November for the biggest event of the year! FFG's World Championships are more than competition. 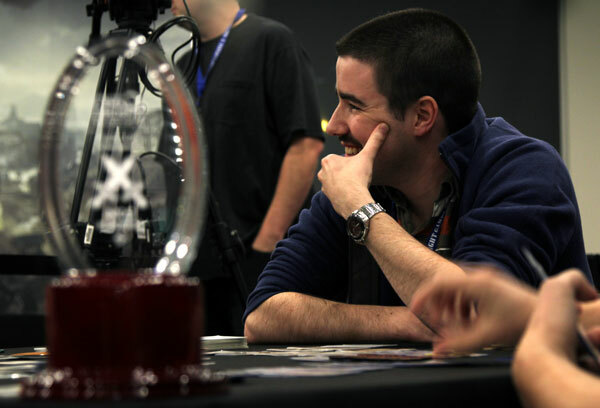 They’re the pinnacle of Organized Play and all for which it stands – a five-day celebration of your favorite games within an extended community of enthusiastic gamers, including players and National Champions from around the globe.